For 14 years, the Pittsburgh Business Times has ranked the region's school districts based on state standardized test score performance, identifying the highest-scoring school districts in the region. In order to determine their Honor Roll ranking, the Business Times uses the PSSA and Keystone test results from the previous three years (i.e. 2018 rankings are based on test scores from 2015, 2016 and 2017). Earlier this week, the Business Times released the 2018 rankings of the region's school districts. Beaver Area School District ranks #20 in the region (n=102) and #68 in the state (n=494). 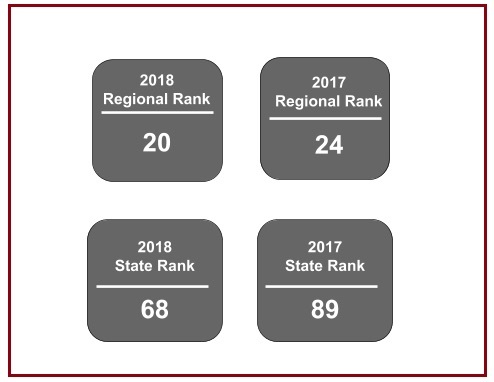 While we are proud of our 2018 ranking and want to celebrate our improvements in both the regional and state rankings, we do so with the caveat that high test scores are only part of Beaver Area School District's standard of excellence. We also applaud our fine arts, music, foreign language, physical education, industrial arts, JROTC, and technology programs for their innovative and engaging programs.